I've gotten to stay in two of the three remaining Wigwam Villages, with the Holbrook one being a highlight of a trip out to LA in 2007. The stay highlighted just WHY you should stay at the quaint places - the owners knew we'd be in late, so he made sure to keep the teepee lights on so we could see it from the highway, and take the right exit. Our father, Chester E. Lewis, had other motels along Old Route 66 in the 1930's in other Arizona cities. He saw his first Wigwam Village in Cave City, Kentucky in 1938. A man by the name of Frank Redford already had a couple of Wigwam Villages built in Kentucky by that time. Our father decided that he would like to build a Wigwam Village of his own. In that time period, the term franchises or chain motels were not known of, much less used. Mr. Redford was more interested in sharing his novel idea than making money. Mr. Lewis and Mr. Redford came to an agreement that radios would be placed in each Wigwam that would play for one half hour for a silver dime. Mr. Redford would then receive the dimes from the radios for a period of some years in payment for the use of his plans. There were seven of these Wigwam Villages built from the 1930's to the 1950's from Florida to California. The one, here in Holbrook, receives a lot of media attention due to it being located on Route 66 and located near several Native American Reservations,Navajo, Hopi, White Mountain Apache Reservations. There are several vintage automobiles that are around the perimeter of the property. 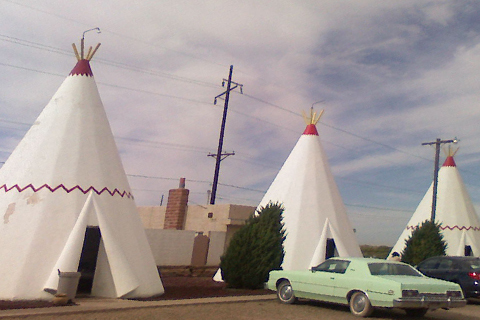 The Wigwam Motel was listed on the National Register of Historic Places on May 2, 2002.